Make sure that neither of the two arm loops are attached to the waist belt yet. These are positioned individually later. If, like in this example, the left shoulder has been operated on, the shoulder strap should be attached to the side with the sewn-in label. If the right shoulder was operated on, simply move the shoulder strap at the back of the waist belt to the other side. Close the strap slightly to the side below the chest. Now position the large forearm loop in the middle of the waist belt. The black fastener is facing towards the patient's head. Secure the affected forearm with the help of the Velcro fastener. The hand is still outside the loop. Attach the smaller loop to the side of the waist belt and fasten the Velcro fastener around the patient's upper arm. It is important that you attach the upper arm loop next to the fastener on the waist belt so you can still open the waist belt. The loops should be positioned at the upper edge of the waist belt to prevent uncomfortable chafing in the bend of the elbow later. The arm and forearm are now resting against the body at an angle of approximately 90°. Pass the thin strap over the healthy shoulder and attach it to the front buckle. Simply adjust the length of the shoulder strap with the help of the Velcro fastener in such a way that the weight is taken off the affected arm, which is securely fixed to the body. Make sure that the shoulder pad is lying in direct contact with the clavicle and that the shoulder strap is long enough to allow the patient to stand up straight later. Once the medi Arm Fix has been adjusted properly, the patient can put the product on alone after the operation. 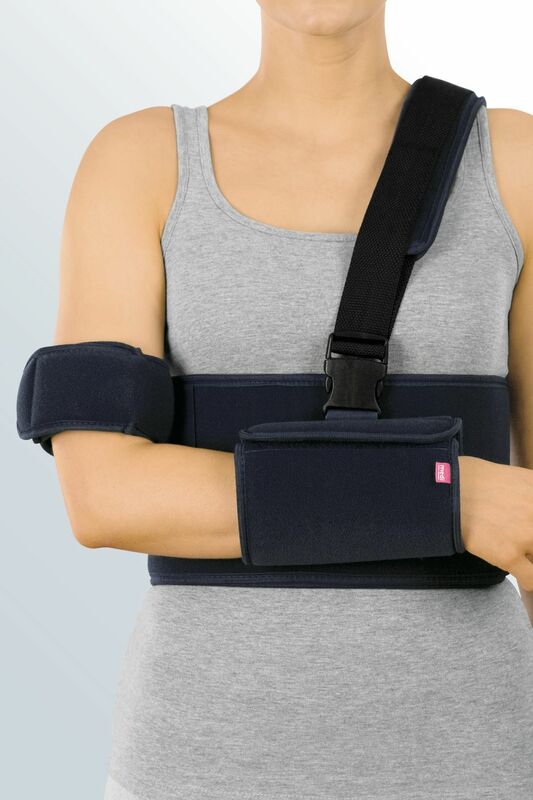 Click here for more information about medi's Arm fix immobilisation orthosis.